When Xiahou Dun recieves damage, he can flip a judgement card. If it is not a heart, he can choose to cause one unit of damage or discard two hand cards from the source. Xiahou Dun gets to decide how he is going to use "Unyielding". 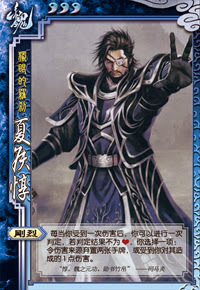 If the target only has one hand card, Xiahou Dun must cause damage. Xiahou Dun's "Unyielding" works on a 'per instance' basis. If he were hit with Wine, he could only flip one judgment. If Xiahou Dun is on the brink of death, he cannot activate "Unyielding" until he is revived. As a result, he cannot flip a judgement card if he dies. When Da Qiao passes an attack or Xiao Qiao passes damage to him, the original player that caused the damage is the person who would be targeted by "Unyielding." If Xiao Qiao passes back damage from Xiahou Dun, the person he targets with "Unyielding" is himself. It is not advisable to activate Xiahou Dun's power in this scenario. Note that "Unyielding" is not enforced, meaning that he can choose not to use it if one of his allies inadvertently hurts him. Xiahou Dun can activate "Unyielding" if he plays a Duel on another player and loses. If Xiahou Dun damages another character with "Unyielding," the other character can activate their retaliatory ability on him. For example, if Xiahou Dun is damaged by Sima Yi and he activates "Unyielding", and damages him. 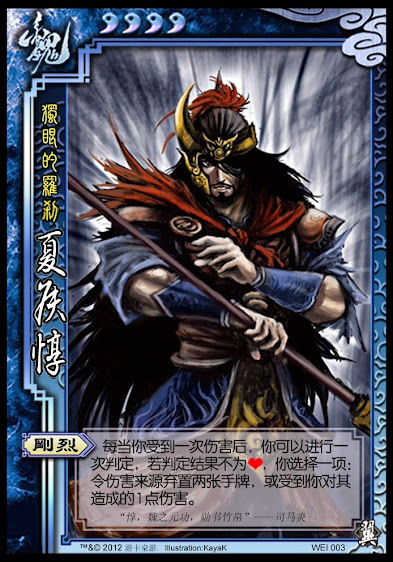 Sima Yi can activate his "Feedback," allowing him to take one of Xiahou Dun's cards.